This article is about the race. For the creatures, see Falmer. The Snow Elves, also known as the Falmer or Ice Elves, are a proud race of mer with an unusually great aptitude for magic. They tend towards cold, remote regions, and inhabited a portion of Skyrim before being displaced by the Nords in the late Merethic Era and early First Era. Before that, they had a civilization which rivaled even the Altmer of the Summerset Isles. They resemble white-haired, pale Altmer, and have very long lifespans, as well as a strong resistance to frost. Legends say they favor spears and archery in combat. 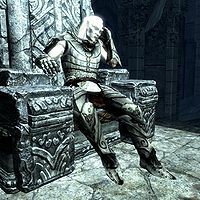 Much as "High Elf" and "Wood Elf" are interchangeable with "Altmer" and "Bosmer" respectively, "Falmer" is really just another term for "Snow Elf". However, most people, even the Snow Elves themselves, demonstrated a preference for "Snow Elf". In this case, time eventually provided distinct meanings for the two terms. Many of the ancient Snow Elves were betrayed in a deal for asylum they struck with the Dwemer. The Dwemer forced their wards to subsist only on toxic fungi which twisted them into sightless slaves. It is the hideous descendants of these slaves, whom other Snow Elves called "the Betrayed", who have come to represent the Falmer to many of the people of Tamriel. People often refer to the grand ancient race of Skyrim elves as Snow Elves, and to their barbaric remnants as Falmer. Few know that an unknown number of civilized Snow Elves rejected the Dwemer's deal. Even fewer know that some have survived, uncorrupted, into modern times. Knight-Paladin Gelebor of the Chantry of Auri-El, the only known and potentially last Snow Elf still alive today, embraced this distinction between "Falmer" and "Snow Elf" because of the negative connotations "Falmer" had accumulated over the millennia. 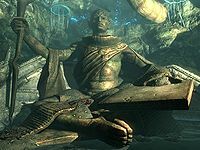 It is unclear whether other mer also inhabited Skyrim (besides the underground Dwemer); early accounts are mostly from the Nordic perspective, which usually only refer to "the elves" without making distinctions. But elves in ancient Skyrim are assumed to be Snow Elves, in whole or in part. The empire of the Snow Elves was expansive, wealthy, and prosperous in the Merethic Era. They displayed power beyond what could be expected of the time. However, they found themselves constantly in conflict with the proto-Nords coming over from Atmora. The Nedic peoples either co-habitated with or were enslaved by the elves in other parts of Tamriel; only in Skyrim did relations break down into widespread conflict. It's unknown when the conflict began; the earliest human settlements in Tamriel date back to ME800-1000, and sources suggest the relationship remained relatively harmonious for some time. Why the elves of Skyrim instigated the Night of Tears is disputed; attributed motives include fear, religious and military provocations, territorial disputes, and a desire to possess an ancient power the humans had uncovered (the Eye of Magnus). Regardless, the elves attacked the human capital of Saarthal one night and razed it to the ground. The only known survivors were the Atmoran-born ruler Ysgramor, as well as his two sons Yngol and Ylgar. They fled to Atmora, only to return with a vengeance. Ysgramor's Five Hundred Companions wiped out any elves they came across, clearing the way for more settlers to come in their wake. The Nords reportedly killed the Snow Elves by the thousands. [nb1] Their descendants continue to glorify their ancestors' genocidal attacks against the Snow Elves; one of the most popular songs in Skyrim is "The Slaying of the Falmer Princes". After wiping out organized elven resistance in Skyrim, the Nordic armies sought their enemy out on the island of Solstheim. The elves made a last stand in the Battle of the Moesring: after an intense battle, their leader, the Snow Prince, was killed, and the elves were routed. The age of the Snow Elves was done. Though they steadily lost ground, the Snow Elves had been firmly entrenched in Skyrim, and they persevered into the early centuries of the First Era. In fact, the massive yet well-hidden Chantry of Auri-El, a great magical and architectural achievement even by today's standards, hadn't even been constructed by the Snow Elves until the early First Era. It was not until the reign of High King Harald (1E 143-221) that the elves were believed to have been driven from the present borders of Skyrim, though the Snow Elves continued to hide in the newly-established Nordic kingdom. The Snow Elves had long maintained an uneasy alliance with the only other known group of mer who inhabited Skyrim: the Dwemer. The Nords established their supremacy in Skyrim, and after the devastating loss of the Snow Prince, most Snow Elves turned to their underground brethren for help. After all, there were many Snow Elf legends lauding the honor and glory of the Dwemer. The Dwemer offered to provide them a haven, but forced their wards into servitude, only allowing them to consume a toxic fungus which rendered them blind. Over time, the servants became slaves. Ancient torture chambers found in Dwemer ruins are suspected to have been used to keep their elven brethren in line. While these Snow Elves are believed to have been rendered blind by the Dwemeri toxin, it's unknown whether it was this or some other tragedy which twisted the Betrayed into the primitive creatures which have terrorized the Nords for millennia: the Falmer. Some Snow Elves managed to avoid becoming slaves to the Dwemer, instead retreating to hidden shrines or hiding with sympathetic families. Over a hundred were at the isolated Chantry of Auri-El when the Dwemer made their offer, and by the time news of it reached them, they were too late to stop it. These few remaining Snow Elves look upon their twisted brethren with pity. However, these sentiments were not shared by the Falmer, as they attacked their untainted cousins with the same ferocity that they displayed towards the other surface races. Over the ages, the Snow Elves fell into legend. [nb2] One of the first real pieces of evidence establishing that the Snow Elves had existed was the discovery of the Snow Prince's remains in Jolgeirr Barrow on the island of Solstheim in 3E 427. Traces of the Snow Elves may be present in the mer of today, as it's suspected that many interbred with other elves before they ceased to exist as an identifiable culture. The Skaal believe that the Rieklings of Solstheim are descendants of the Snow Elves, although scholars argue that they are simply snow goblins. 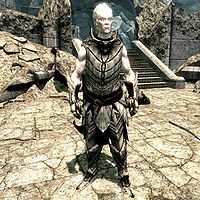 The strange race known as Ice Warriors, found in the icy caves of Glacier Crawl, were also thought to possibly be a remnant of the Snow Elves. These beings are uncommunicative with outsiders, but the icy blue-skinned humanoids fit the description of the ancient Snow Elves. The garrison town of Dawnstar was once besieged by the glacier tribes, or 'Ice Tribes'. These were blue-skinned humanoids that had tamed trolls and the dreaded Gehenoth as war beasts, and had plotted with the traitorous champion of the town. Some legends claim Wispmothers are the last remnants of the Snow Elves. By 4E 201, what was once superstition had become, more or less, common knowledge: the increased activity of the underground Falmer made it increasingly difficult to dismiss them as myths. It is thought that their activity is related to a planned invasion of the surface world. Other elves are repulsed by the idea that these Falmer were once mer like themselves, and many wonder whether these monsters are truly all that remain of the legendary Snow Elves. Around this time, the Great Statue of Irkngthand, built in secret by the Betrayed, was discovered by the Thieves Guild. It was perhaps the only known depiction of the ancient Snow Elves. However, when the thieves removed the Eyes of the Falmer (which are giant gems of enormous value), it caused the cavern to collapse, burying this priceless treasure. Little is known of the Snow Elf society, other than that it parallels that of the Altmer. They kept in contact with other elven kingdoms. They developed a complex and nearly indecipherable language. Only a few people in Tamriel can even recognize their alphabet, let alone read it, making it an ideal cipher for anyone with the proper knowledge seeking to encode their writings. They developed their own method of telling time, and magnificent architectural achievements, among other things. The Altmer and Snow Elf pantheons overlap significantly, possibly entirely: both acknowledge Auri-El as the sovereign and venerate Trinimac, Syrabane, Jephre, and Phynaster. They had temples to all of them, though none were as impressive as their Chantry of Auri-El. Their writings reference "Young Ones" and "Old Ones", though how precise this distinction is and its significance in their society is unknown. Many of the most dedicated Snow Elves once committed themselves to a tireless journey through the massive Chantry of Auri-El, carrying with them the paramount desire to become one with their god, Auri-El. After it was constructed in the mythical Forgotten Vale of western Skyrim, the Chantry quickly became the epicenter of the Snow Elf religion. The retreat was designed for those who wished to become enlightened. Initiates entered the Chantry through a cave representing the absence of enlightenment, and carried a ceremonial ewer to each of the wayshrines, small sites of worship which were scattered throughout the Chantry which were used for both meditation and transportation. Each shrine was tended to by a Prelate, who taught the initiates the mantras they were supposed to recite. After visiting the Wayshrines of Illumination, Learning, Resolution, Radiance, and Sight, and dipping the ewer into the water basin of each, the initiates finally arrived at the Inner Sanctum at the end of their pilgrimage and had an audience with the Arch-Curate, a Snow Elf who communicated directly with Auri-El. The only known Arch-Curate was Vyrthur, brother of Gelebor, who was infected with vampirism by an initiate around the time of the Snow Elves' downfall and spent millennia plotting revenge against Auri-El for allowing this to happen. Though all set out with the determination to prove their worth, few initiates were prepared for the trials of the Chantry. The pilgrims struggled not only against the natural elements of the treacherous vale the Chantry was built in, but with a myriad of tests upon their faith and loyalty. There was great glory for those who succeeded and great shame and scrutiny for those who did not. But the tales of those who reached the Inner Sanctum are not without their share of woes. It is said that upon their arrival, many were mere shells of the person they had once been. Some were quite mad from sleeplessness and starved to the point of frailty. By the end of their journey, the marvel that they had strength yet to carry their vessel and ascend the stairs of the temple was the last true testament of their loyalty. Regardless of each individual's tale, the final words remain eerily similar. It is said that every pilgrim ascended, bathed in light, a look of relief and contentment on their face. 1. According to one story, the Snow Elves were neglected by Sai, the God of Luck. 2. In the Fourth Era, con-men were known to peddle "Falmerblood Elixir", claiming it could make people live for thousands of years, see into the thoughts of others, learn a library's worth of knowledge in moments, or grow back a missing limb. For information on the Falmer language and alphabet, see this page.